“Smile” like the look of a child opening a toy capsule bought from a vending machine of Smile s.r.l. Massimo and Franco, Smile's founders, were the first who guessed the potential of this new sales concept of licensed toys and gadgets in the Italian market. In 2000 Smile started in Italy the distribution of toys and gadgets of the most important licenses produced by Tomy Yujin Europe (TYE), a Company division of a Japanese international company, world leader in toys sector, and in 2003 Smile brought out the product Winnie the Pooh Animal Wear, which became a real craze, in a very short time. Grown-up people and children, men and women with no age limit bought the funny Disney little bear, which started to be the perfect friend you can always bring with you, hanged on the mobile phone, on the zip of the sweatshirt, handbag or backpack. Afterwards Smile included in its staff a team of people working in the creative department who proposes and realizes new concepts and new drawings for its current and future collections. 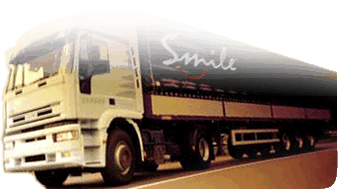 In its over 20 years of experience in the vending sector, Smile has always stood out for innovation and search of products quality and safety as well, to offer to its costumers. Thank you very much for visiting our web site. Kind regards from Smile Team.